We at IntraHealth International are devastated by the loss of our dear friend and colleague, Raluca Iosif. Raluca was killed in an act of senseless violence in Durham, North Carolina, on October 6, 2015. IntraHealth has established the Raluca Iosif Memorial Fund to honor Raluca’s legacy, and to ensure that her deep commitment to global health, and to ending injustice, inequity, and violence against women, lives on. Gifts to the fund can be made online or via check to IntraHealth International, 6340 Quadrangle Drive, Suite 200, Chapel Hill, NC 27517, attn: Raluca Iosif MF. 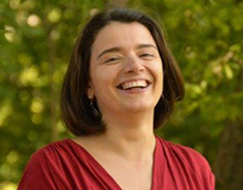 Raluca was a dedicated member of IntraHealth’s program development team. As senior program development manager, she led teams to develop initiatives that expanded IntraHealth’s work and global impact. Her sharp wit, bright spirit, and devotion to making health care available to more people around the world are an inspiration to us all. IntraHealth has established theRaluca Iosif Memorial Fund to honor Raluca’s legacy, and to ensure that her deep commitment to global health, and to ending injustice, inequity, and violence against women, lives on. A committee of Raluca's family, close friends, and IntraHealth colleagues will oversee the administration of these funds to best honor Raluca’s life and work.